Alang & Madan, situated in Kalsubai range, are one of the most difficult fort treks in Nasik District. Alang (4852 ft):The beautiful Alang Fort lies in the Nashik region. Top of the fort is huge plateau. There are two caves on the fort for staying and 11 water cisterns arranged in a Cascade formation & a dilapidated storage room. 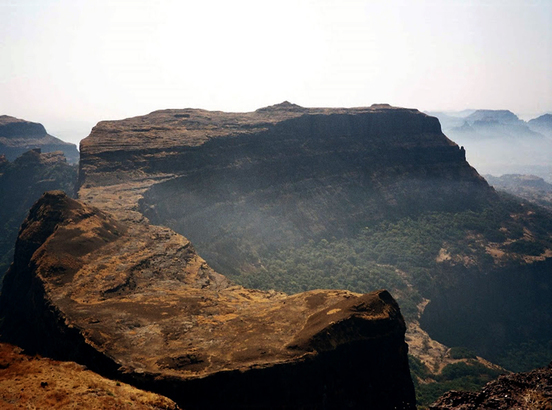 Madan (4841 ft):Madangad is considered to be one of the most difficult forts to climb among all the forts in the Sahyadris. The area of the fort is quite small as compared to Alang and Kulang, its adjoining forts. There are only two water tanks on top of the fort. The area visible from the top of the fort is quite scenic. Day 1 (Saturday) : 09-03-2019Proceed towards the base village, Ambewadi. Reach base village and Rest. Start trek by 7 am. Reach the col between both the forts by 11 am. Climb and explore the Alang Fort. Overnight stay at Alang fort. Day 2 (Sunday) : 10-03-2019Watching the Sunrise, start descending Alang. Reach the col between two forts and start climbing the Madan Fort.Explore the Fort and the surrounding. Post lunch, start descending the Madan Fort. Evening back to Ambewadi and proceed towards Kasara by 5 pm approx. 1. Kasara to Kasara by local jeeps. 1. Wear Bright clothes as it would be hot.